23:16 erev unto the morrow after the seventh Shabbat shall ye number fifty days; and ye shall offer a new minchah unto YHWH (יהוה). 23:17 Ye shall bring out of your habitations two wave loaves of two tenth deals: they shall be of fine flour; they shall be baken with chametz; [they are] the firstfruits unto YHWH (יהוה). 23:18 And ye shall offer with the lechem seven lambs tamiym of the first year, and one young bullock, and two rams: they shall be [for] a Olah unto YHWH (יהוה), with their minchah, and their drink offerings, [even] an offering made by fire, of sweet savour unto YHWH (יהוה). 23:19 Then ye shall sacrifice one kid of the goats for a chattat, and two lambs of the first year for a sacrifice of shelamim. 23:20 And the Kohen shall wave them with the lechem of the Bikurim (firstfruits,בכרים) [for] a tenufah (wave offering, תנופה) before YHWH (יהוה), with the two lambs: they shall be kodesh to YHWH (יהוה) for the Kohen. 23:21 And ye shall proclaim on the selfsame day, [that] it may be an Mikra Kodesh unto you: ye shall do no melekhet (work) avodah (laborious) [therein: it shall be] a statute for ever in all your dwellings throughout your generations. "You shall also count for yourselves from the day after the shabbat, from the day (Exodus 34:22; Numbers 28:26; Deuteronomy 16:10,16; Leviticus 23:15-20). Hag haAtzeret (end /cessation, end of counting of omer, end of Pesach season (Atzeret shel Pesach) because style="font-family:Arial;">Pesach is not complete without Shavuot because redemption of Messiah Yeshua is not complete until we receive the power of Ruach HaKodesh which Yeshua had promise to give us the comforter (yuh) and ability to live a Kadosh unto YHWH. 2:41Then they that gladly received his word were baptized: and the same day there were added unto them about three thousand souls. Shavuot is the second of the three major festivals (Passover being the first and Sukkot the third) it is apart of three months Aviv, Iyar and Sivan. 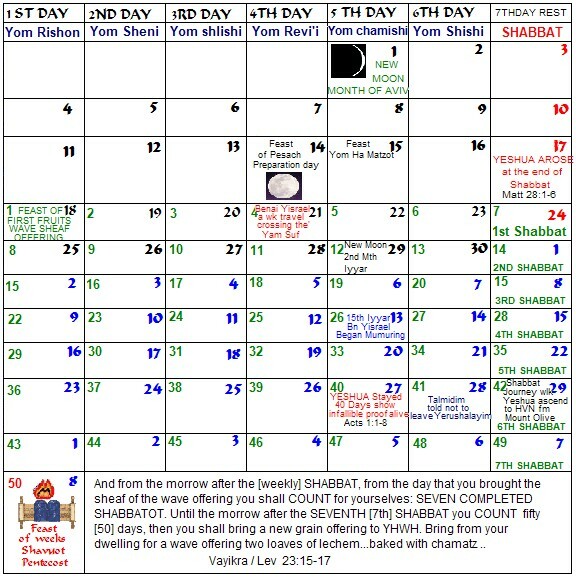 Shavuot occurs exactly fifty days after the second day of Passover. In this biblical holiday it is usual custom to have a complete with special prayers, holiday candle lighting and kiddush, and no forms of work and labour are allowed. Every year on the Feast of Shavuot, we reenact this historic moment. Hashem re-gives the Torah, and we lovingly reaccept, and reaffirm our fidelity to Him alone. Three times a year you shall celebrate a feast to Me." You shall observe the Feast of Unleavened (Chag HaMatzot); for seven days you are to eat unleavened bread, as I commanded you, at the appointed time in the month Aviv, for in it you came out of Egypt. And none shall appear before Me empty-handed." Also you shall observe the Feast of the Harvest of the first fruits of your labors from what you sow in the field; also the Feast of the Ingathering at the end of the year when you gather in the fruit of your labors from the field." Three times a year all your males shall appear before the Lord GOD." You shall not offer the blood of My sacrifice with leavened bread; nor is the fat of My feast to remain overnight until morning." You shall bring the choice first fruits of your soil into the house of the LORD your God. You are not to boil a young goat in the milk of its mother." On the fiftieth day after the waving of the First of the First Fruits, comes Shavuot, known as the day of the giving of the Torah. To the Non-Jewish believer in Yeshua, on the fiftieth day after our Messiah resurrection, comes , known as the day of the outpouring of the Ruach HaKodesh, it is also known as the birth of the Assembly where by every believer has the indwelting of the Ruah HaKodesh that would teach them the scriptures; also the One who writes the Torah on our hearts (Jeremiah 31:31-33). the Word is now our Source of all Life and walk righteous before Hashem (Elohim) via Messiah Yeshua. 16:11 And thou shalt rejoice before YHWH Eloheicha, thou, and thy son, and thy daughter, and thy eved, and thy amah, and the Levy that [is] within thy she'arim (gates), and the stranger, and the fatherless, and the widow, that [are] among you, in the place which YHWH Eloheicha hath chosen to place his name there. The Feast of Shavuot (means weeks, sheva, seven, represent completion and perfection, Pentecost Greek for Fifty; the Feast of Weeks, the Feast of Harvest; Ingathering, is one of the Shalosh Regalim one of the three required annual pilgrims.) On this day the Kohen waved two loaves of bread made from the finest of flours and baked with leaven. "'No grain offering... shall be made with leaven...you shall not offer up... any leaven or any honey as an offering by fire to YHWH." The "new grain" - feast was wheat, the source for bread, the staple of life. Bread is type of the Word of Elohim and our Messiah is the living Word. ?He said, "I am the bread of life.... if anyone eats of this bread, he will live forever; and the bread also which I will give for the life of the world is My flesh? (Yochanan 6:33-35,48,51) Messiah Yeshua also stress the point that "Man does not live by bread alone, but by every word that proceeds out of the mouth of YHWH" ( see also Devarim 8:3; MattiYahu 4:4). The giving of the Torah took place in the month of Sivan¡ªthe third month. Since this was clearly part of the Divine plan, there must be a significant connection between the event and the date, between Torah and the third month. The point is made explicitly in the Talmud: ¡°Blessed be the Merciful One who gave a threefold Torah to a threefold people through a third-born on the third day in the third month.¡± The figure three is the constant motif. The Torah is in three parts: Pentateuch, Prophets and Hagiographa (Torah, Neviim, Ketubim). Israel consists of three kinds of Jew: Kohen, Levite and Israelite. Moses was born third, after Miriam and Aaron. The Torah was given in the third month, on the third day of the Israelites¡¯ separation from their wives. Why, then, the figure three? Surely the Torah was intended to be unique and to reveal the oneness of G-d. The number one is what we would have expected. To take the point further. The principal event of the third month was the giving of the Torah in itself. The commandments, as such, were not an entirely new disclosure. There had been commandments before: The seven Noachide Laws, circumcision, and the things that were commanded at Marah. Sinai certainly changed the nature of a Mitzvah, but the idea of a Mitzvah was not new. But the Torah was. And the difference between Torah and the commandments is this: through a Mitzvah one becomes nullified in the face of G-d’s will, as a “chariot to its rider.” But through Torah we become one with G-d. The two things are not the same. A chariot has no will other than that of its rider, but chariot and rider are not one. The innovation at Sinai was radical—now the Jew could become at one with G-d. And if so we must ask again: Why is three, not one, its symbol? WHAT IS THE DIFFERENCE BETWEEN THE MOSAIC COVENANT AND THE RENEWED COVENANT? Mosaic Covenant = Torah written heart of stone and Renewed Covenant Torah written heart of flesh. WHAT IS THE RENEWED COVENANT ? Ezekiel 36:26 A new heart also will I give you, and a new spirit will I put within you: and I will take away the stony heart out of your flesh, and I will give you an heart of flesh. Shemot 20 - 10 Mitzvot, 613 Mitzvot, New Covenant and the Noachide Laws Just as Shavuot we wave the bread to remember that our Father's Word is alive and that it is ever bringing forth a harvest in our lives.